Breast cancer patients with high levels of vitamin D are more likely to survive the disease than patients with low vitamin D levels, reports a new review. Researchers analyzed five studies that included 4,443 breast cancer patients who were followed for an average of nine years. Those with high levels of vitamin D (an average of 30 ng/ml) in their blood were twice as likely to survive as those with low levels (an average of 17 ng/ml, which investigators note, is the average blood level of vitamin D for breast cancer patients in the US). “The study has implications for including vitamin D as an adjuvant to conventional breast cancer therapy,” says co-author Heather Hofflich, DO. 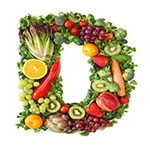 While researchers recommend randomized controlled clinical trials to confirm the findings, Garland suggests physicians consider adding vitamin D into their breast cancer patients’ standard care. “There is no compelling reason to wait for further studies to incorporate vitamin D supplements into standard care regimens since a safe dose of vitamin D to achieve high serum levels above 20 nanograms per milliliter has already been established,” says Garland.